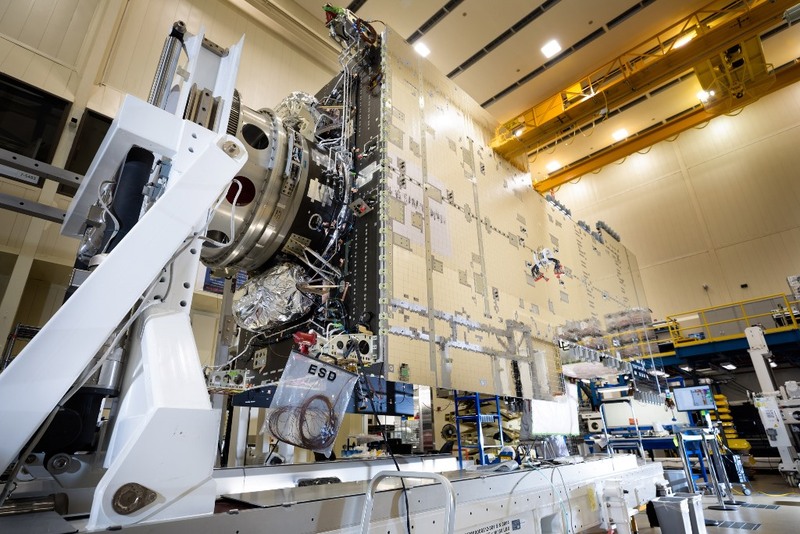 Engineers with Colorado-based Lockheed Martin have finished integrating the first, modernized, A2100 satellite – an upgraded version of a design that has been successfully deployed numerous times in the past. What will become the Hellas-Sat-4/SaudiGeoSat-1 satellite will now undergo final assembling and testing and is slated to launch in the first half of next year (2018). The A2100 bus utilizes a hybrid propulsion integrated with the payload module as well as transponder panels. The A2100 uses a combination of electrical Hall current thrusters as well as a liquid apogee engine. These will be used to place the Hellas-Sat-4/SaudiGeoSat-1 spacecraft into its final orbit (and will also keep the satellites in their intended orbit). More than 40 spacecraft on orbit today are built on the A2100 bus, with Lockheed Martin in the process of producing five more of the modernized spacecraft for upcoming missions. The spacecraft also uses a reconfigurable processor which can be reprogrammed on orbit. The contracts for the Hellas-Sat-4/SaudiGeoSat-1 and Arabsat 6A satellites were awarded on April 9, 2015, with separate launches for both spacecraft set for sometime in 2018 – the former atop an Arianespace Ariane 5 ECA and the latter atop a SpaceX Falcon Heavy. If everything goes as it is currently planned, the two spacecraft will provide services for some 15 years.